Shortarmguy's Crazy Emails: Sorry, Hunters! This is the pull-off at SR 61 and Adamsdale Road in Schuylkill County , Pennsylvania . The deer was hit there and reported to the Game Commission for pick up. The couch was dumped there previously. Local residents couldn't resist. Day two, the deer was on the couch. Day three, the end table and lamp showed up. Day four, the TV and stand showed up. Finally, a State Trooper stopped and had to call PENN DOT. They had to wait because of all the people stopping to take pictures. The sign, mockingly from the deer, drew a lot of attention. 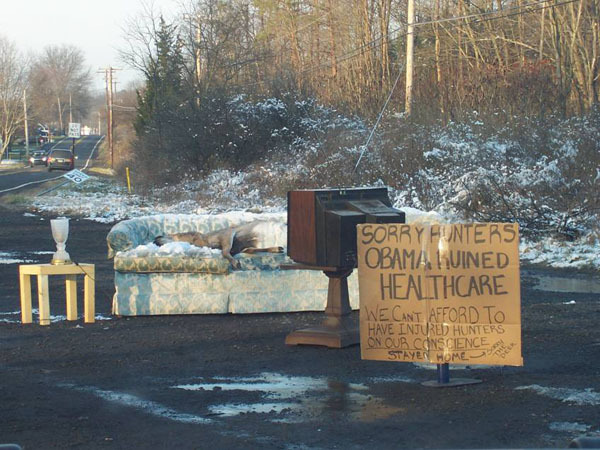 The cardboard caption in front of the deer on the couch reads, "Sorry Hunters, Obama ruined healthcare. We can't afford to have injured hunters on our conscience. Stayed home. Sorry, the deer."